you can see her project and a full tutorial here. 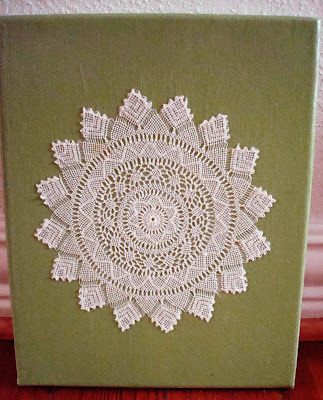 i have several doilies that i inherited from my grandmother and her sister. they were handmade by their mother, my great grandmother. i love that my family has a tradition of handmade crafts that i get to carry on. 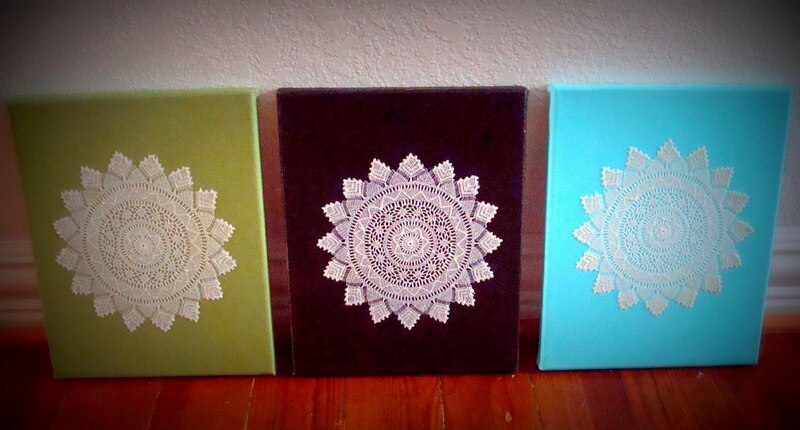 i wanted to test “the doily project” on some doilies that didn’t have sentimental value, so i found 3 for $1.50 at an estate sale. i changed up the original project, using painted canvases instead of scrapbook paper. it turned out well, i think. 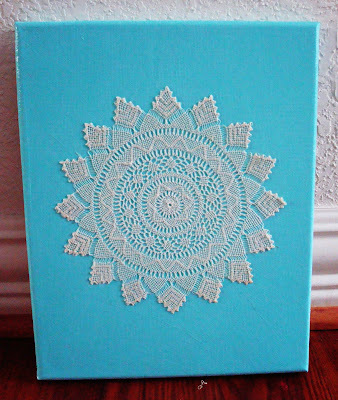 the colors are fun and modern, but the doilies are delicate and antique. i love the contrast. 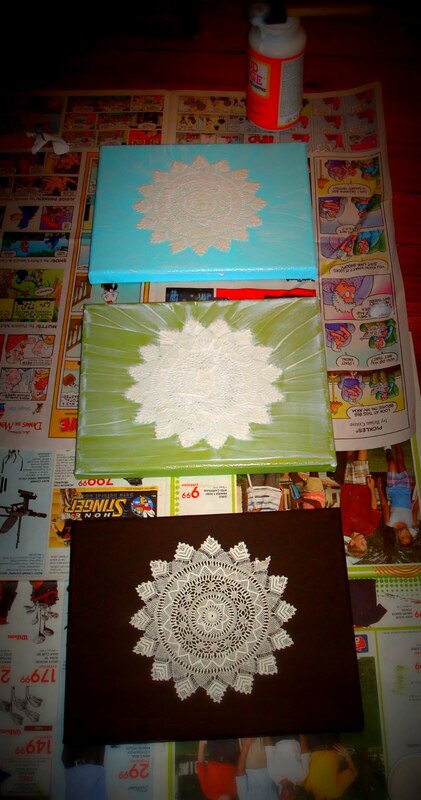 i bought 3 canvases at micheal’s and painted them with acrylic paint and a sponge brush. 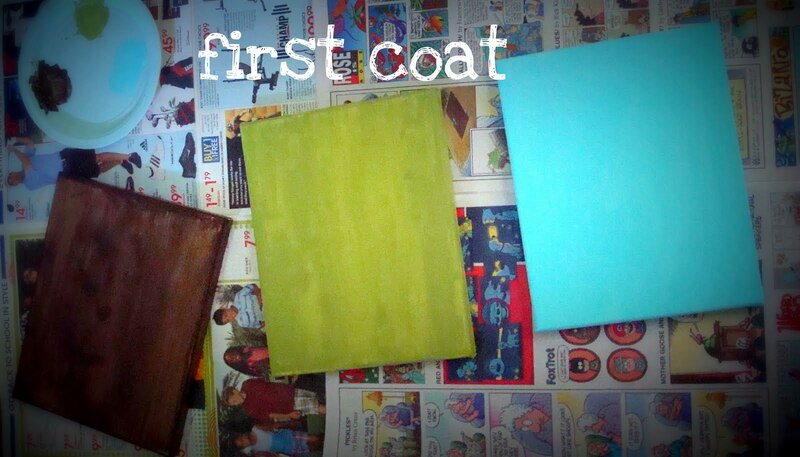 it took 3 coats, but eventually looked great. 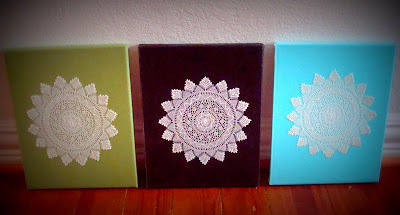 i centered the doilies and then poured a good amount of mod podge on top of them. i smoothed the mod podge with a foam brush, covering the doily completely as well as the frame. 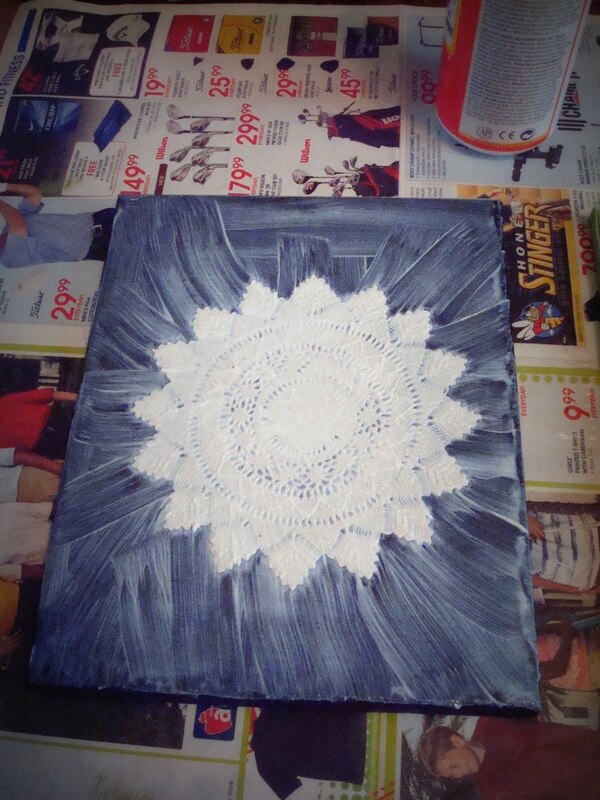 it will look a little funky until the mod podge dries. 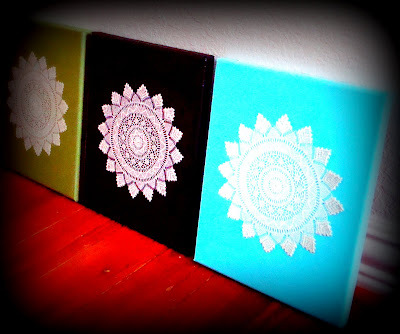 i patiently waited for the mod podge to dry, and the finished canvases look great. for other awesome mod podge products, check out mod podge rocks, a blog that is totally about mod podge projects. do you have any heirlooms that you’ve used in craft projects? i’m linking to some great parties. check them out here and join the fun. Ahhh…how PRETTY…this is such a neat idea and I have lots of dollies! Hope you have a FUN weekend. I am working on how to display old barbering tools. Not sure yet what I want to do. I have a doily that my grandma made, but I have it behind glass in an old frame with fabric behind it. Your idea looks like fun. I may try it with one that I’m not so attached to. Love the colors you chose! These are really neat! I love the colors you used too! These are very pretty! Neat idea! WOW this turned out really nice. I love the bright colour canvas idea the colours you choose are perfect and would brighten up any room/space! I love those!! They are super cute! thanks for the feedback y’all! ron & connie – i wouldn’t do this with my grandmother’s either. i have hers on display as well. i bet you can come up with something really cool for vintage barber tools. I LOVED this idea using doilies (and I’m not a doily kind of gal), and I had to share it! I featured you here. Those are so fabulous. I absolutely love them! i must admit that i really dont like dollies, but you somehow have made be like them. 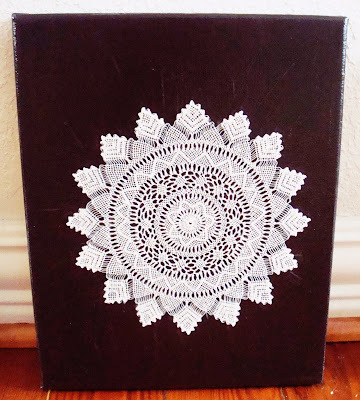 Pingback: Doily project inspiration and sharing time.